To keep my book Software Takes Command (Bloomsbury Academic, July 2013) from being excessively long, I omitted Chapter 6. Lev Manovich. Chapter 6 from Software Takes Command (not included in the book). 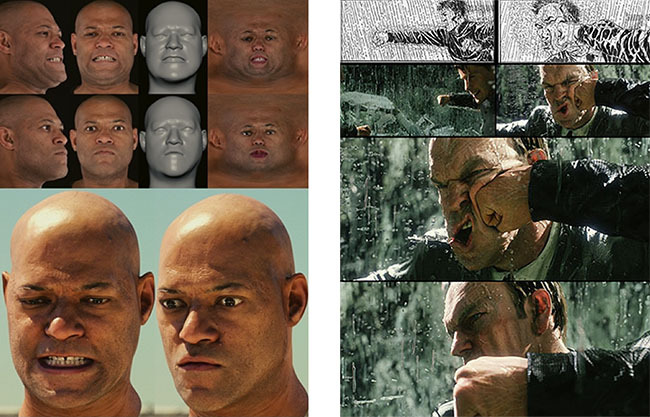 Today filmmakers and media designers often use the techniques of 3D computer graphics, traditional animation, and cinematography in combination to create new hybrid moving image forms. The results are hybrids which do not fit any moving image mediums we know from the 20th century. In this chapter I discuss this process using the example of a particularly intricate hybrid – Universal Capture method used in the second and third films of The Matrix trilogy. The unique properties and techniques of different media became software elements that can be combined together in previously impossible ways. Both the simulated and new media types — text, hypertext, still photographs, digital video, 2D animation, 3D animation, navigable 3D spaces, maps, location information, interactive elements — function as building blocks for many new media combinations. This leads me to view contemporary media development using a model of biological evolution and its concept of massive numbers of species that share common traits — away from the modern model of a small number of very different mediums with their unique languages. Instead of trying to place any particular project, app, or web service in some category selected from a small number, we can instead view it as a combination of the techniques selected from a very large pool. Some of these combinations occur more often; others may only occur once. The successful combinations become popular, leading to similar projects; and some may become design patterns used in numerous applications.